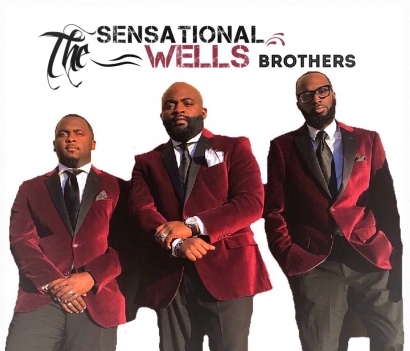 THE SENSATIONAL WELLS BROTHERS The Sensational Wells Brothers have all of the elements of a dynamic and anointed family singing group undeniable talent gifts that seamlessly complement each other harmonies that only siblings can deliver and perhaps most importantly a praying grandmother. Showing promise and musical talent since they were small children their gifts which were birthed and nurtured at their home church first started gaining the attention of others and eventually took them all around their native city where they sang and played instruments at varying local churches groups and choirs. While they were all pursuing and developing their gifts individually their beloved grandmother Mother Elzeno Wells spoke a word over them that foretold their destiny that they would come together as a group and touch the world with their music. While that vision didn?t come to pass right away or even while Mother Wells was alive God?s word rang true as it is written in Ecclesiastes 3:1 - ?To everything there is a season and a time to every purpose under heaven.? That time proved to be on October 3 2009 when Charlous Brown Thomas Luckett Anthony Parks Jonathon Atkins Stedman Williams Zachary Smith Leeland Thompson Trent Wells and Octavious Smith manifested the vision of their late grandmother to pass with their debut concert aptly titled ?The Coming Out of The Sensational Wells Brothers.? On that night they introduced a unique sound and a palpable anointing that was sure to win souls to Christ. The individual gifts that they had cultivated and developed melded together perfectly like the pieces of a jigsaw puzzle being joined together to create the complete picture. Since that introductory concert in 2009 The Sensational Wells Brothers have traveled throughout multiple regions and have impacted the lives of everyone they come into contact with. Their mission is simply to bring as many souls to Christ as they can by utilizing the gifts that God has placed within them. And they are doing exactly that. Gearing up for the release of their newest single titled ?I?m Looking? The Sensational Wells Brothers still proudly and boldly carry the mantle of ministry that was placed upon them by God through the praying hands of their grandmother. ?I?m Looking? is the latest platform through which they do so with their original presentation their fresh sound and their inimitable chemistry that only a lifetime of shared experiences can produce. This is a song that is sure to minister and encourage everyone who is seeking the grace presence and promises of God in their lives. The Bible reminds us to ? ?look to the hills from whence cometh our help for our help comes from the Lord.? The Sensational Wells Brothers encourage listeners everywhere to keep ?Looking? to the Lord and for the Lord in all their circumstances and situations.